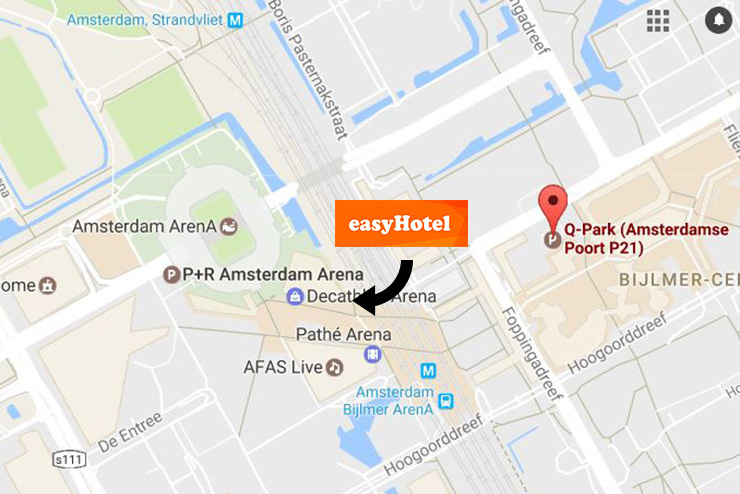 P+R Transferium Amsterdam Arena is a cheap parking location at the Amsterdam ArenA stadium, located in Amsterdam-South and accessible by taking the exit Ouderkerk (exit 1) on the A2 and follow the signs to the ArenA. Driving into the ArenA parking, take the entrance P+R P1. The ArenA parking has many P+R spots available, but do note that during events in the area such as a soccer game or concerts the P+R is closed. The parking fee depends on the time of arrival at the P+R. The maximum parking time in the P+R is 96 hours. You can pay at the terminal with usage of a bankcard or credit card. ATTENTION: If you want to qualify for the low P+R rate you always need to travel to a stop within the central area of Amsterdam’s public transport. De P+R GVB cards are available at the blue machines (1 per person, max. 5 cards per car). The rate for a GVB card (public transport ticket for max. 2 persons) is € 5. Each additional person pays € 0,90 per person extra. When arriving back at the P+R you can pay at the machine for your parking. Here the machine checks if your last trip to the P+R was within the central area of Amsterdam. If your last trip with public transport did not happen in the last hour within the central area to the P+R, you have to pay the normal parking rate. 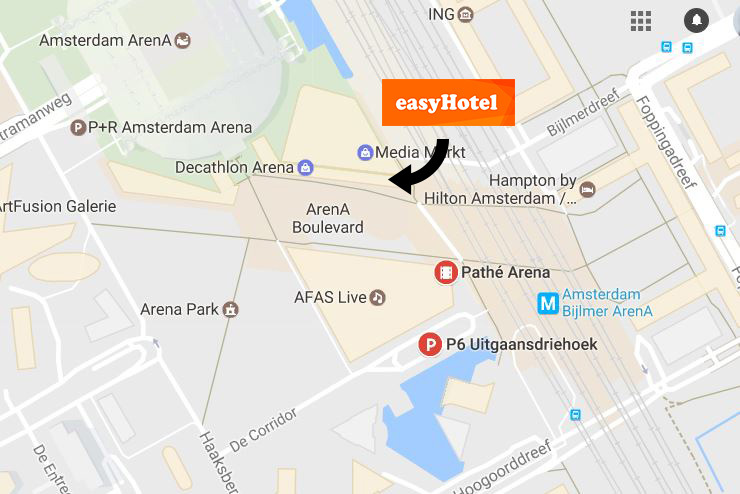 This underground parking garage is located below the Pathé Cinema at the Arena Boulevard, 200 meters from the easyHotel. The address is De Corridor 15, Amsterdam Zuid-Oost. 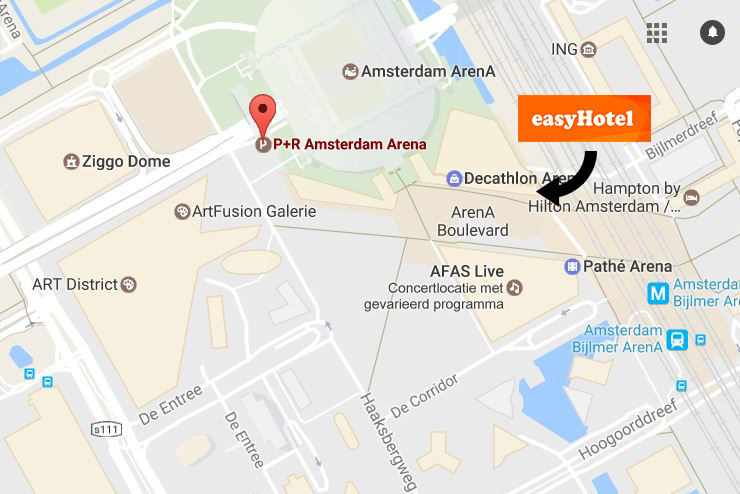 From de A2 you should take the exit 1 ”Amsterdam-Zuidoost / Ouderkerk ad Amstel / Transferium”. 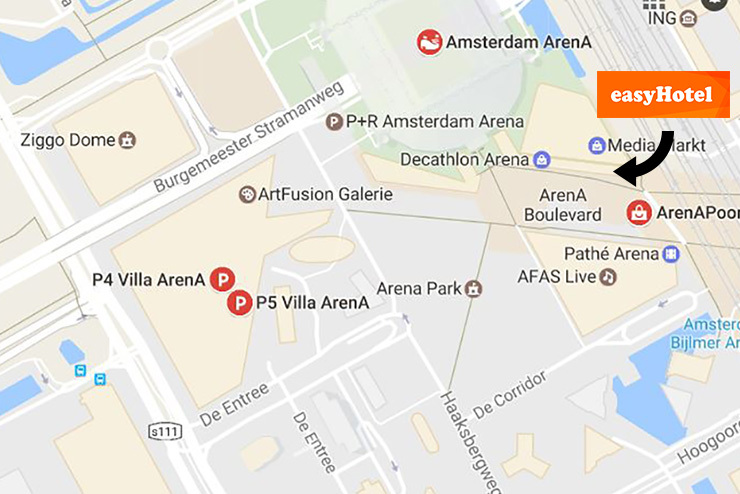 Follow the signs P4 or P5, which will lead you to the following address: De Entree 1, 1101 BH Amsterdam Zuid-Oost. 15 minutes walking from the hotel you will find two parking options called P21 and P22. The rates for these parking areas are each € 0,50 per 21 minutes with a maximum day rate of € 13,50. When you exit the parking you will enter a square. If you walk from the square to the station you will find next to the station our hotel.